As I found, this is not resolved bug from many versions and I think it not need additional explanation, but I can provide if need. Begin Play event in parent character not starts. Tick and other works as expected. Now I created custom event and I start it from child character, but I think parent/child system is for avoid situations like this. Thank you. I will check your file later today (now I can't). I think it's because I'm first create child character class then parent and and set it as parent for child character class. Many reasons why. If bug will still exists I will post all my steps. Than you again for fast response. I've set this up and it appears to be working as intended in a clean project. I've provided the project for you below so you can have a look at it, and let me know if you are doing anything differently. Your example working, and I'm using like this in other my project ways, but I think it just not starting when you make parent / child not from browser - as child etc, but creating new class as blueprint and set it as parent. I still can do full steps later, but this is not real bug I think, just confusing. (this bronze parent script I add before, menu is to show how). 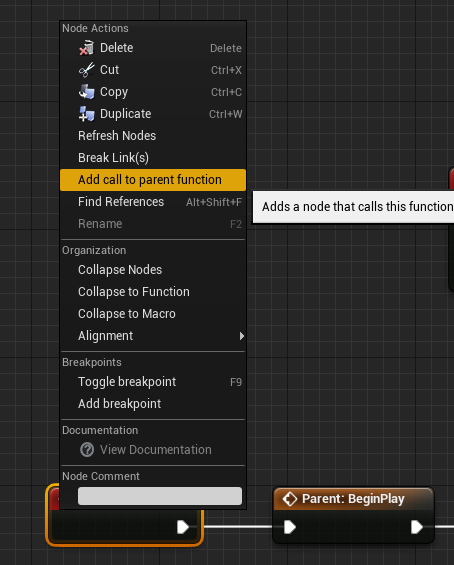 Just I'm used to have ready parent event starts when I'm creating child blueprint from parent - opposing way it not working (I think) - parent scripts are not add to (new) child blueprint. This is enough for me and I can close this question, but I think this is confusing and parent scripts should be add same way as you creating child blueprint - you decide.